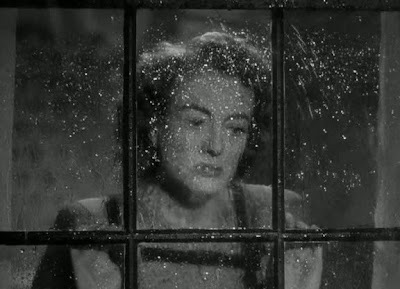 To wrap up the first half of the first season of Hit Me with Your Best Shot, Nathaniel R of The Film Experience has selected the 1947 Joan Crawford vehicle Possessed – the second of two otherwise unrelated Crawford pictures with that title – for anyone who wishes to partake to watch the movie and pick their favorite image. I do not know why he chose this picture above all other options, but I’m ecstatic that he did: I’d never seen it before, and it is a trip. Saturated in post-WWII sexism, and freely mixing sudsy melodrama with film noir, psychological horror, and a message movie about the difficulties of coping with and diagnosing mental illness, it’s not remotely perfect, but my God, is it ever fun to watch, with Crawford herself giving a terrific performance (netting her second Oscar nomination) as a woman suffering from some kind of mental disorder, recalling her own history to doctors while heavily drugged – and boy oh boy, does the movie ever make sure you remember that the bulk of the story we’re watching, the flashback, is being communicated by a wildly unreliable narrator. Everything from the narrative ellipses to the costumes to the unconventional use of sound practically beg us to second-guess just about every moment we see onscreen. I am not, however, meant to be reviewing Possessed. Though damn it all, if you are the kind of viewer who has any use at all for Crawford being bugfuck nutty, or Van Heflin being greasy and evil, or post-war American cinema and the problematic sexual politics thereof, you must seek it out. It will treat you right. Anyway, a best shot. Which was, here, incredibly hard to pick. I can’t say that I’ve ever registered the name of director Curtis Bernhardt (though I’ve seen other films he made), and I dislike cinematographer Joseph A. Valentine’s work as often as not, but they went all-out in this film, though in truth, most of the absolute best shots involve sinuous, voyeuristic camera movements that can’t be readily communicated by a still. Which was both freeing and annoying, because it cut out some of the most obvious choices. 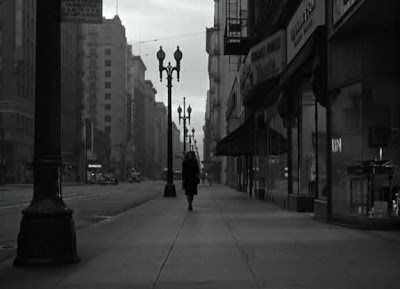 A first-year film student could tell what’s going on here, but I’m going to pretend that it needs me to analyse it: we have a whole mess of greys, from the watery grey sky to the dirty greys of the sidewalk and road to the charcoal grey of the lightposts. And in this world of grey – i.e. this world of ambiguity and shading – there is one and only one absolutely black element, the woman in the center walking towards us. Not only is she the darkest thing in the frame (and the eye invariably tends to focus on whatever the most contrasty element is in an image), she’s the only moving object onscreen, and virtually every other object in the frame is devoted to the single task of directing our eye straight to her. Despite being relatively tiny, she dominates this image completely, and this opening gambit communicates one thing with absolute, exquisite clarity: this woman is going to control us for the rest of the movie. And since she’s all in black, we can guess that she’s probably going to be pretty bad news, at that. Both of these things turn out to be thrillingly true, and I will leave it up to you to find out how and why. For lagniappe, I present my first runner-up, without commentary.